The American and French publics, who a decade ago bitterly disagreed over the U.S. invasion of Iraq, now see eye-to-eye on the looming military strike against Syria because of its alleged use of chemical weapons against its own people. In principle they both think there are times when it is necessary to use military force in the pursuit of justice. They both favor United Nations support for any Syrian intervention. But contrary to the plans of U.S. President Barack Obama and French Present Francois Hollande, who appear poised to be allies in an attack on Syria, both the French and American publics would prefer that their countries just sit this one out. France and America were allies in the American Revolution, World War I and II, Afghanistan and in the 2011 bombing of Libya. The much ballyhooed Franco-American finger pointing over the Iraq war was actually an historical aberration. And the French and American publics often are of the same mind over military matters. Americans (75%) and the French (62%) both agree, for example, that it is sometimes necessary to use military force to maintain order in the world, according to a Pew Research Center survey in 2011. The French (66%) are more supportive than Americans (45%) of the principle of getting UN approval before using military force to deal with international threats. But on the immediate issue of UN backing for action in Syria, 59% of Americans say the United States should first get a UN resolution to use force before taking military action against Syria, according to a Pew Research Center poll conducted August 29-September 1, 2013. And in an August 26-28, 2013 online IFOP poll 55% of the French supported military intervention in Syria if it had UN sanction. 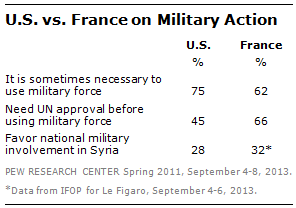 But publics in both nations oppose their own militaries getting involved in Syria. In the United States, just 28% favor U.S. airstrikes against the regime of Syrian President Bashar al-Assad and 63% oppose them, according to a Pew Research Center survey conducted September 4-8, 2013, a 15 percentage point increase in opposition in a week. Similarly, in France, only 32% back French military engagement in Syria and 68% are against it, according to an IFOP poll conducted September 4-6, 2013, a nine point increase in opposition. And both Obama and Hollande are losing support for any action among their political base. In the latest Pew Research survey 53% of Democrats oppose U.S. airstrikes, up from 48% a week earlier. And opposition to French involvement among Hollande’s Socialist party members has also grown from 39% in late August to 46% in early September.